Rioters! As I recently mentioned, I'm helping to organize a book club in the Chicagoland area. I've had a wonderful response from many of you that said you wanted to either join as an online member or start your own local chapter. Right now, we'd really like for this to be a local group so that we can actually meet in person. Of course, if you'd like to start a local chapter of The Spineless Book Club, let me know! 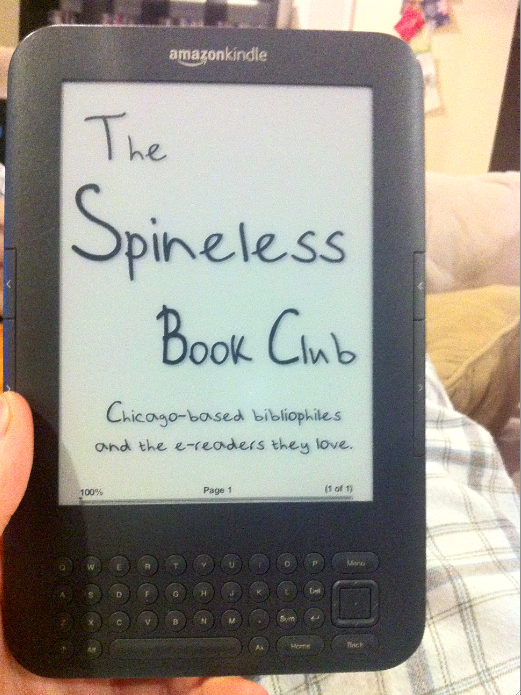 I've set up a group page on Goodreads.com for The Spineless Book Club. If you'd like to join the local group, please feel free to sign up there! I'll be posting updates, events, photos, etc. on the Goodreads page. The first meeting of The Spineless Book Club will be on February 5. We'd like to get it started on something like the 2nd Sunday of each month. This seems to be a pretty universally open date for most folks. We're not exactly sure at what location the meeting will take place, but I'll post that as soon as we get it figured out! Hope to see you join the group! Remember, the first book is The Night Circus by Erin Morgenstern, and you have a little over a month to read it. Pick up your copy today - either a physical copy or a spineless one! - and get reading! Here are the direct links to the Spineless Book Club group.